Rabbi Shoshana Perry came to Congregation Shalom in 1998 as its first full-time rabbi. At the time, the congregation was a small community of about 100 families. In the last 15 years the congregation has seen enormous growth, now numbering about 200 families. Rabbi Perry is committed to working in partnership with the lay leadership of Congregation Shalom to insure that the congregation maintains its strong sense of community, warmth and vibrancy. She believes that Jewish learning needs to be a life-long pursuit, and that a synagogue should be a place where each person, young and old, can learn, explore and question. Rabbi Perry also believes that Jewish life flourishes when creativity, mutual support and respect are the foundation of prayer, education and decision-making; she is excited to work with a talented group of lay leaders to bring this vision to fruition. For Rabbi Perry, social justice and the prophetic tradition of Judaism is the core element of her rabbinate. She feels strongly that a congregation needs to be a place where Tikkun Olam – the healing of the world – is a central force for Jewish life. Rabbi Perry’s commitment as a rabbi is to help each member of the communities she has served find a meaningful doorway into Jewish life. Rabbi Perry was born in Mt. Vernon, NY and as a teen was very active in the Reform Jewish youth movement – NFTY, serving two terms on her regional board. As a high school and college student she worked in one of the Reform movement’s camps, Joseph Eisner Institute for Jewish Living. Rabbi Perry went to Colby College for two years. She then graduated from the College of the Atlantic in Bar Harbor, ME with a degree in Human Ecology, which is a system of thought that sees all aspects of life – biology, ethics, sociology, culture, the environment, politics, etc. – as being inter-connected. This understanding of interdependence and relationships has been a foundation for the way Rabbi Perry approaches her work. After graduating from college, Rabbi Perry attended seminary at the Hebrew Union College-Jewish Institute of Religion and was ordained in 1989. While in rabbinical school, Rabbi Perry served as a chaplain at Memorial Sloan-Kettering Cancer Institute and also as a rabbi at a residential treatment center for emotionally disturbed children and teens. In addition, she served several small congregations as a student rabbi. Before coming to Congregation Shalom as the community’s first full-time rabbi in July 1998, Rabbi Perry served as Associate Rabbi at Temple Isaiah in Lexington, MA for four years, as Rabbi to Congregation Beth El of Bangor ME for seven years and as Assistant Rabbi to Keneseth Israel in Philadelphia for two years. 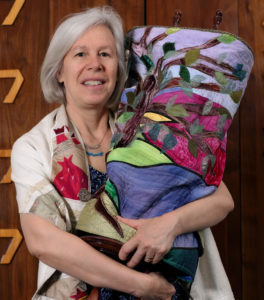 In whatever community she has served, she has been active in inter-faith clergy associations and is very committed to the work of Outreach in her work within the congregational setting, welcoming interfaith families into the synagogue as well as Jews-by-Choice. She was a member of the STAR Good to Great program and was selected as a Balfour Brickner Fellow of the Religious Action Center of Reform Judaism. Rabbi Perry is married to Hale Powell, a retired energy consultant, and together they have one college-age daughter. She loves the outdoors, gardening, family time, walking her dog and reading. Finding Community within Community: Join a Chavurah!